Aruba is a magical island, where opulent high-rise resorts and casual beachfront low-rise Aruba resorts are complemented by the natural beauty of turquoise Caribbean waters, pristine beaches and stunning panoramas. Choose a one-stop, action-filled all-you-can-eat-and-drink family vacation or wind down and be pampered at a stylish and tranquil retreat with luxury accommodations and a rejuvenating spa. Beaches along the windward coast are in more secluded and undeveloped areas. Here magical coves carved out of limestone and inlets formed by the relentless pounding of waves are overlooked by craggy desert terrain. Because of strong undertow and crashing waves, swimming here is not recommended. But the beaches on Aruba’s wild coast do afford tranquillity, privacy and unique natural phenomena. All inclusive vacation options are affordable and fun, and provide an exhilarating hassle-free one-stop stay featuring around-the-clock fun and all-you-can-eat-and-drink! The perfect option for vacationing on a budget, Aruba all-inclusive resorts not only offer sumptuous buffets and open bars but also locations right on the beach; a whirlwind of water sports and activities; exciting nightlife including casino gambling, brilliant shows and musical entertainment; and comfortable rooms and suites for singles, couples and families with small children. The many sites include exploring natural wonders throughout Arikok National Park, Casibari and Ayo rock formations and Indian caves. 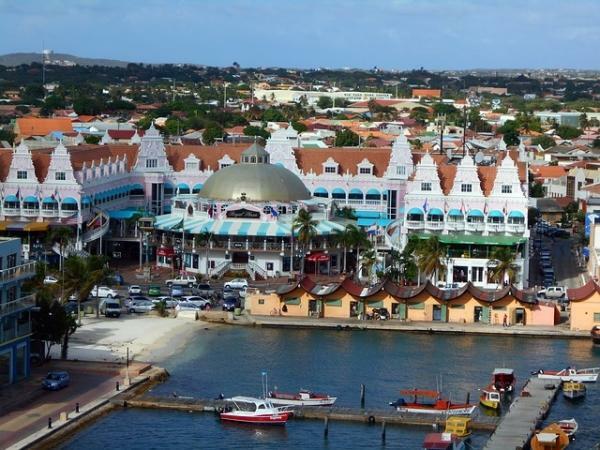 Walk through history at the Bushiribana gold mill, Alto Vista Chapel and the museums in downtown Oranjestad. Fascinating attractions include art galleries, the Butterfly Farm, Ostrich Farm, Donkey Sanctuary and Aruba Aloe factory. Aruba nightlife adds excitement to the island’s quiet desert island persona. Mingle with locals and tourists at any of the scores of casual beach and pier bars that dot the southwest coast from downtown Oranjestad to the far end of the high-rise strip. Weekly managers’ cocktail parties and daily happy hours are island traditions. Shop the enormous selection of international brand name products and prices that are 10 – 35% lower than in the United States. Jewelry store-lined streets and upscale malls with prestigious international brands pepper the downtown area, while gleaming new shopping/entertainment centers front the high-rise resorts.